Aristotle’s view of the universe as eternal—as everlastingly undergoing change—leads him to question the cause of everlasting change. He attributes all the changes constantly occurring on earth to the motion of the heavenly bodies. But what keeps them everlastingly in motion? It cannot be something that is itself in motion or changing in any way. If it were, it, too, would need a cause of its motion, a cause of its changing. Given infinite time, one might go back from effect to cause in an infinite series and never reach a first cause—a mover in motion that is not itself moved by something else in motion. efficient but the final cause of my entering the store—the reason why I move in that direction. To move everything else without itself being moved or in motion, the prime mover, Aristotle argues, must function as an attractive or final cause. In thinking this, he did not have in mind the gravitational attraction that the earth exerts upon the bodies that fall to its surface, or the gravitational attraction that the moon exerts upon the tides. In his view, attractive or final causes operate on intelligences that can respond to them and adopt them as motives for action. When he says that a heavy body that falls to earth wishes to come to rest there, he is speaking metaphorically, not literally. That motion is only like the motion of the person that is attracted by the candy in the window to enter the store. intelligences function as motors through being attracted by the prime mover of the universe. immutable. But to be immutable, in Aristotle’s view, it must also be immaterial. Anything that is material has potentialities: it is subject to change or motion. It is also imperfect, for at any time it is not actually all that it can be. We have seen, in earlier chapters, that that which is purely or completely potential cannot exist. Nothing exists that is not actual in some respects, while being potential in other respects. The reverse, however, is not true. Pure actuality (form without matter) can exist, though pure potentiality (matter without form) cannot. It is by such reasoning that Aristotle came to the conclusion that the prime mover is pure actuality—a being totally devoid of matter or potentiality. In addition, this immaterial being is a perfect being, a being lacking no perfection that remains for it to attain. This perfect being, which is the prime mover of the universe, Aristotle called God. It is difficult if not impossible to explain the potentiality that must be attributed to the stellar intelligences if they are not pure actualities. Something that is both immaterial and has potentiality does not fit easily into Aristotle’s scheme of things. mythical. Yet it is interesting to follow the reasoning that led him to affirm the existence of the immaterial and perfect being that he called God. That reasoning provided a model for later thinkers in their efforts to prove the existence of Good—not Aristotle’s God, but the God of Genesis, the God who created the world out of nothing. respects: the immateriality, the immutability, and the perfection of the Divine Being. But Aristotle’s Prime Mover only serves to account for the eternity of the universe and its everlasting motion. 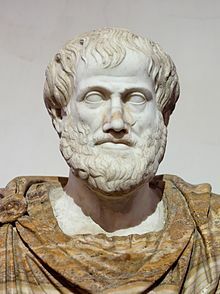 It was the need to explain that which led Aristotle to develop his theory of the motion of the heavenly bodies and his concept of the Prime Mover as the final cause of their movements. nature to work on. He does not make something out of nothing. He is, therefore, not creative in the way that God is thought to be creative. what is asserted by that sentence. Since he thought the universe to be eternal, would he not have denied that the universe had a beginning? And, denying that, would he not also have rejected the notion of a God who created it? that may or may not exist. If the world does not exist necessarily, it may cease to exist. What, then, keeps a world that may cease to exist everlastingly in existence? conception of God as Creator, not just as Prime Mover. In one sense of the word, to create is to cause something that does not exist to come into existence. In another sense of the word (a more subtle sense, perhaps), to create is to cause the existence of that which may or may not exist, without regard to its coming into existence. It is in the latter, more subtle sense of the word that Aristotle might have conceived God both as Prime Mover and as Creator. The Aristotelian theories described in this chapter and the theory that I have suggested he might have developed within the framework of his philosophy are not common sense. They are not even refinements of common sense, though they may be based on such refinements. In this very important respect, the theories dealt with in this chapter differ from the philosophical views we have considered in earlier chapters of this book. The theories dealt with in this chapter might be regarded a Aristotle’s theology, not his philosophy. If his theology is not related to our common-sense thought, as his philosophy is, it is at least related to common religious beliefs—religious beliefs that have prevailed in Western civilization for more than two thousand years. This fact is my reason for thinking that Aristotle’s conception of God, and the reasoning that led him to develop it, should be included in this book.